Warner, M.E. and J. Rukus (2013), "Planners Role in Creating Family Friendly Communities: Action, Participation and Resistance," Journal of Urban Affairs, 35(5): 627-644. A national survey of planners conducted with the American Planning Association in 2008 assesses planners’ attitudes about barriers and opportunities to creating more family friendly cities. The survey measured the extent to which planners promote the interests of families in zoning, housing, child care, transportation, recreation, urban design and public participation. Regression analysis shows that communities that have more action on the ground in support of families (e.g. affordable housing, child care, walkable streets) also engage families more in the planning process and include needs of families in site planning and zoning. Action can lead to community resistance, but resistance is lower in cities that have more positive attitudes about families with children. 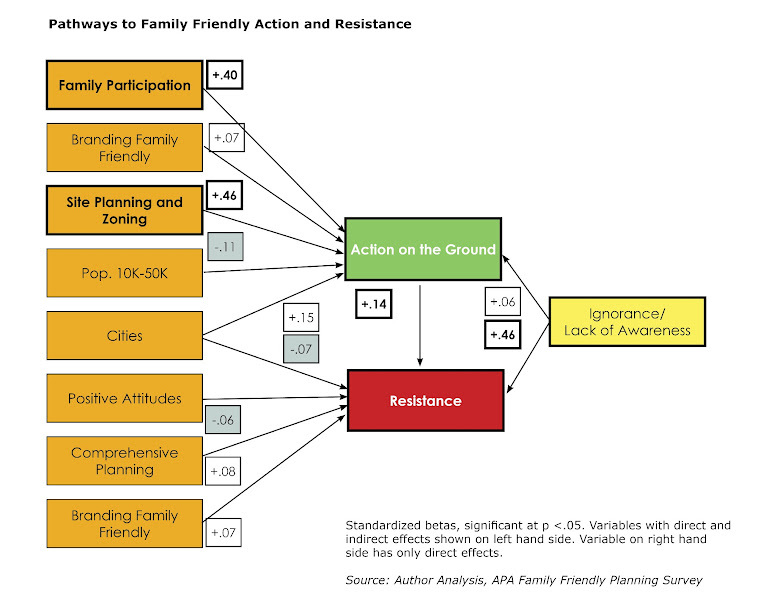 Resistance is higher in communities that are ignorant about how to address family needs, and in communities that specify family friendly goals in their comprehensive plans. This research suggests the key to real action is family participation and addressing family needs in site planning and zoning.